Unit 4, Easter Court, Europa Boulevard, Westbrook, Warrington WA5 7ZB, U.K.
Kawasaki Robotics (UK) Ltd is the UK robotics division of Kawasaki Heavy Industries Japan. 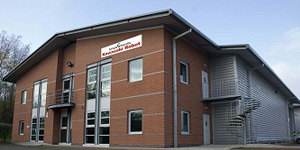 Based in Warrington, Kawasaki Robotics (UK) Ltd occupies a 10,000 Sq. Ft. Building. Its location provides easy access to the main motorway network and is at the center of its customer base. The facility centralises all the sales and customer support operations, with areas for customer demonstrations, training, robot test and integration and a large area for stock machines. Over 2,300 machines are now operating in a wide range of industries and applications throughout the UK.